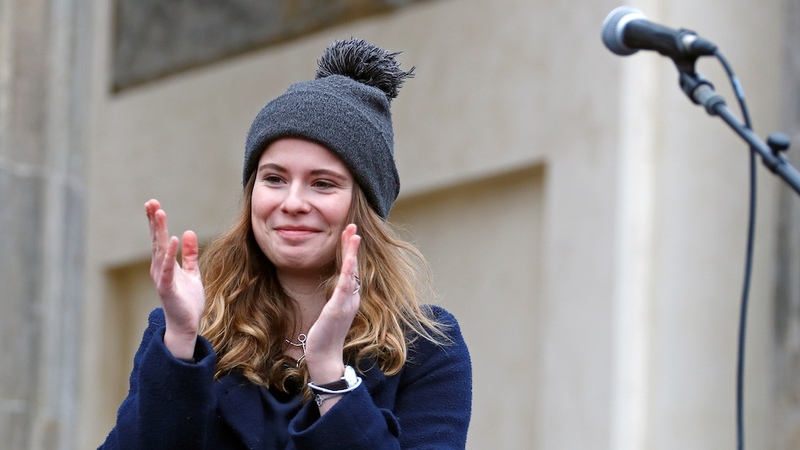 The 22-year-old student Luisa Neubauer is often referred to as “Germany’s Greta.” Yet Neubauer is a force of her own and she’s taking Germany’s establishment to task for failing to halt climate change. Third-year geology student Luisa Neubauer is often referred to as “the German Greta,” after the Swedish teenager Greta Thunberg, the frontperson of the global Friday school strikes who has risen to international fame. But Neubauer, the face of Germany’s Fridays For Future protests, is an original—a wily strategist and practiced activist behind the well-informed, revved-up young people who are calling out the country’s political class for failing to address climate change. Within a few short months, Neubauer and her cohorts have motivated hundreds of thousands of people to join the campaign and have reframed the debate in Germany. It’s something that neither activists nor think tanks, scientists nor Green Party politicos had managed to do. By putting themselves at the center of it, the youngsters have linked the present and the future of the climate change conundrum in a cogent narrative. The issue is no longer one of distant people and the distant future, but rather it’s about them, the youngest generation, which demands a response to “the climate crisis,” terminology they’ve introduced, with credible strategies to secure their future. Neubauer conveys this urgency wherever she goes, and this year she’s already had audiences with the French president, EU commissioners, and German cabinet ministers. “The politicians have to act, now,” she recently told German public radio, underscoring that the movement’s focus has expanded from the shutting down of coal-fired power plants to the big-ticket challenge of designing a sustainable world. “We have to ask ourselves how we want to organize the economy and live and work without wrecking the planet,” she says. Almost overnight, Neubauer, a Hamburg native, has gone from being a virtual unknown to a media sensation, her words and picture splashed across the German press and blogosphere. At the demonstrations, it’s plain that she resonates with many of her generation (especially those much like her—an important caveat.) She doesn’t outwardly appear particularly hip, much less radical. Her usual demonstration attire is jeans, a royal-blue woolen jacket, and her signature charcoal-gray winter hat with fat pompom. “She looks normal even though she’s quite extraordinary. This is why so many people can relate to her,” says Insa Vries, an activist from Ende Gelände (Here and No Farther), a climate group that embraces civil disobedience. Neubauer’s cell phone is her communications hub, from which she helps manage the social media accounts that are the global movement’s sole means of coordination. The branches in 120 countries link up and spread their message via Twitter, Facebook, Instagram, and WhatsApp. That’s how on March 15, the Global Climate Strike amassed 1.6 million protesters worldwide—the largest student-centered demonstration ever. In Germany alone, some 300,000 young people skipped school to demonstrate in more than 150 German towns and cities. Perhaps this is simply Neubauer’s 15 minutes of fame, and her novelty will wear off quickly. But at the moment the German media can’t get enough of the speed-talking young woman who takes on the talk shows’ usual suspects with a poise and self-confidence beyond her years. “The young people, like Luisa, they have the facts right and they wield them very effectively,” says Volker Quaschning, a professor of renewable energy systems at the University of Applied Sciences in Berlin and founder of Scientists for Future, a group of 26,000 natural scientists supporting the movement. The student activists, he says, scoured the Internet to find and read the scientific studies that explain global warming and the potential of renewable energy. “They can show up the politicians and pundits because they haven’t read them,” he says. The first few school strikes in Germany, in Berlin, the port city of Kiel, and elsewhere broke out last November, inspired by Thunberg, who had plunked herself on the steps of Sweden’s parliament, the Riksdag, with a cardboard sign reading “School strike for climate.” Luisa and Greta first crossed paths in early December 2018, at the UN climate summit in Katowice, Poland, and agreed to work together, across borders. Neubauer, despite her age, was no stranger to grassroots organizing. She had worked in a wide range of campaigns with organizations such as 350.org, ONE, Young Friends of the Earth, Foundation for the Rights of Future Generations, Fossil Free Germany, and the German Green Party’s youth wing, among others. As a child, she had marched for environmental causes alongside her grandmother, a veteran of the 1970s environmental movements which gave rise to the Green Party. As high school student, she took on plastic waste and fracking. At her college, Göttingen University in central Germany, where her scholarly focus is sustainable businesses, she was among the activists who forced the administration to divest from all of its holdings in gas, coal, and oil. The question that just about everyone asks Luisa Neubauer is when the school strikes will end. Neubauer says they‘ll return to school when Germany agrees to exit coal in 2030—rather than 2036, as planned. It is, however, virtually unthinkable that Germany’s coal commission will reconvene and renegotiate the exit date that it set just months ago. If they don’t, says, Neubauer, then they’ll strike until 2030—that’s 813 Fridays from now.